The history of needlepoint starts thousands of years ago with the ancient Egyptians who used small diagonal stitches to sew together canvas for their tents. This diagonal needlepoint stitch is still called the “tent stitch” and is one of the most popular needlepoint stitches used to make needlepoint rugs. Howard Carter, the British Egyptologist who discovered the tomb of Tutankhamen, found needlepoint in the cave of a Pharaoh who lived around 1500 BCE. Fast forward 3,300 years to early 19th century England and America and needlepoint has become a fashionable pastime of affluent women. What made needlepoint such a popular hobby was the availability of beautiful needlepoint patterns published in Berlin, Germany and exported to England and America. These Berlin patterns came with dyed wool yarns and stitch by stitch instructions laid out on graph paper. Even a novice could stitch stunning three-dimensional needlepoint patterns. Another reason for the popularity was that more women had more leisure time than at any time before in history. The Berlin pattern markers were greatly aided by rapid progress in chemical dyes which made many bright colors possible. A 19th-century Berlin needlepoint pattern inspired the Asmara Garden Trellis Needlepoint Rug 1601BK. Rug Design © Asmara, Inc.
Fast forward two hundred years to 1972 and President Richard Nixon's opening of China. With thousands of years of history in fine embroidery and painting, China offered a once in a life time opportunity to make fine needlepoint rugs. For about a 20 year window before labor costs skyrocketed, Asmara produced needlepoint rugs in it's own workshop in China which were based on original paintings created by artists in our Massachusetts studio. A needlepoint rug is made by stitching colored wool yarns through a stiff open weave canvas. The canvas is made of cotton threads coated to make them extra strong. The needlepoint artisan covers the entire canvas with individual needlepoint stitches using dyed wool yarn. This creates a new flat weave fabric which is highly durable and can withstand years of foot traffic. The pattern of the needlepoint rug is created by making stitches with yarns of different colors according to a precisely counted pattern. 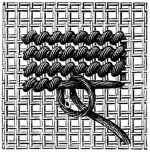 There are many different types of needlepoint stitches, the most popular is the tent stitch, followed by the cross-stitch. 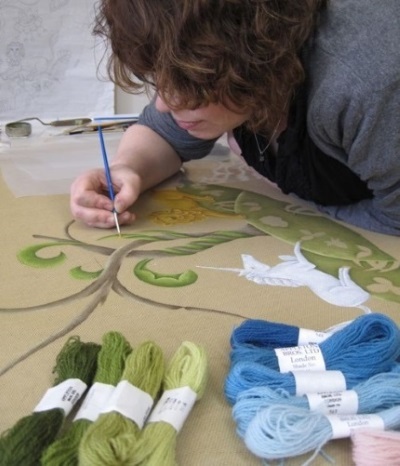 A needlepoint artist painting the pattern directly on the cotton canvas so the embroiderer can stitch with different colored yarns as shown in the painting. Image courtesy The Royal School of Needlework, London. In England needlepoint is sometimes called "tapestry," which is misleading because true tapestry is made by on a hand loom and has warps and wefts. Needlepoint on the other hand, is stitched with a needle on a canvas. If you think Needlepoint rugs are only for classical and traditional rooms you will be surprised how well they work in contemporary spaces. Needlepoint rugs may look fragile, but looks are deceptive in this case. The millions of hand made wool stitches in a needlepoint rug make them highly durable. Needlepoint rugs are perfect for living rooms, libraries and dining rooms. Use a high quality non-skid rug pad as it will keep the rug firmly in place and also provide some cushioning. Artist designed needlepoint rugs are the most desirable, as they bring a fresh young energy to a room. 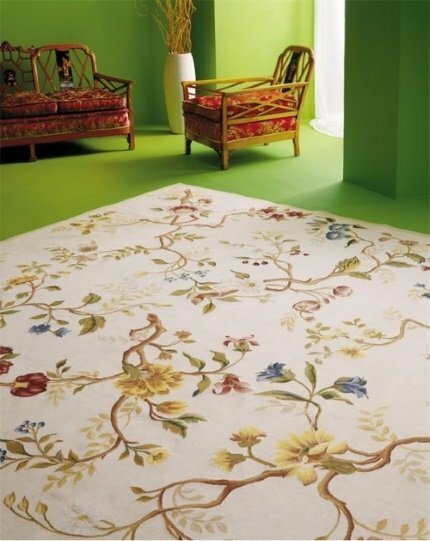 Needlepoint rugs that have clear colors will enliven a room. Avoid rugs with dull colors as well as bland reproductions of antique rugs. Buy a rug only if you love the colors and pattern. Do not be swayed by a royal provenance. Look for Needlepoint rugs that will work with both contemporary and traditional furniture because this will give you the ability to create really interesting interiors and also make it easy to change the decor should you want to in the future. The best way to select a needlepoint rug is to try a rug corner sample in the room. If a sample is not available, try the actual rug in the room. Asmara ships rug samples by UPS. Just click the orange "Request Sample" button on the page of the needlepoint rug you like. 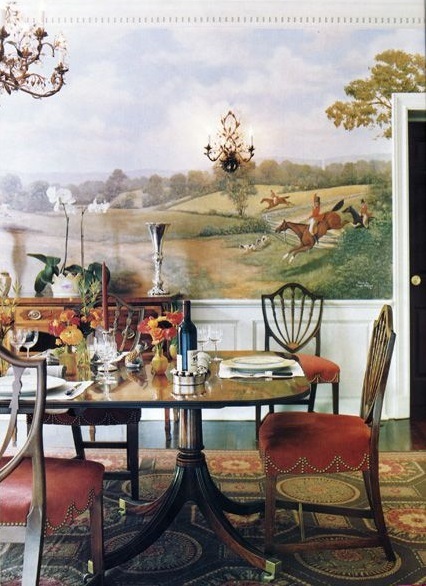 Here are 15 ideas for decorating with Needlepoint rugs illustrated by these fabulous rooms. 1. An artist designed needlepoint rug with clear blues, yellows, reds and greens allows you to mix antique and contemporary furniture. The Branches Needlepoint Rug 2172E is a perfect complement for antique Chinoiserie sofa and chairs and contemporary vase. Interior design by Koch Studio. Rug Design © Asmara, Inc.
2. A needlepoint rug in a classical Bessarabian pattern and colors such as cream, beige, charcoal, gold, red and green is great for bringing a sense of history, comfort and luxury to a library as in this handsome space by Kay Genua Designs designed around the Hermitage Needlepoint Rug 2406HM which was inspired by an antique Bessarabian rug similar to the one in Brooke Astor's library in the picture below. Image courtesy Kay Genua Designs. Rug Design © Asmara, Inc.
3. 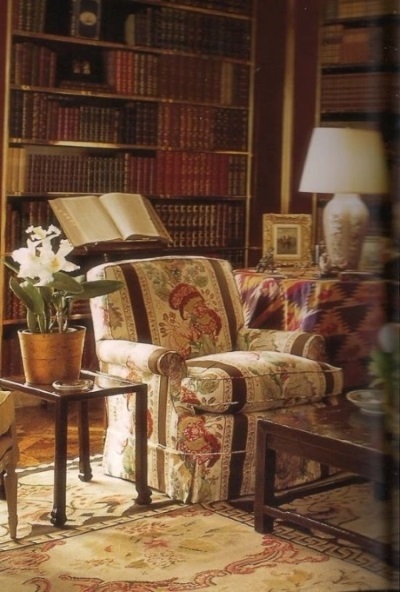 The Bessarabian rug in Brooke Astor's famous red lacquer library designed by Albert Hadley is similar to the Hermitage Needlepoint Rug 2406HM in the library by Kay Genua in Image 2. Image courtesy Albert Hadley. 4. An artist designed clear colored needlepoint rug is ideal for bringing a youthful energy to a traditional living room as designer Asia Baker did with the Asmara Summer Needlepoint Rug 2148C in her ancestral home in Mill Neck, New York. Image courtesy Vogue. Rug Design © Asmara, Inc.
5. 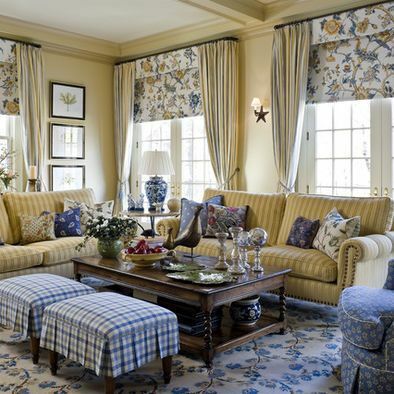 Design an elegant sunroom around an artist designed beige and brown geometric needlepoint rug as Greenwich, Connecticut designer Cindy Rinfret did with the Asmara Ascot Needlepoint Rug 1326D. Rug Design © Asmara, Inc.
6. 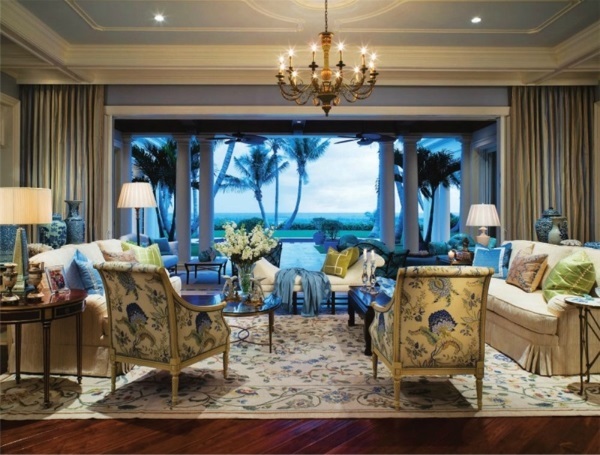 The blues, yellows and greens in the Gradella Needlepoint Rug 1201Y allows you to enliven a seaside living room as Marc-Michaels Interior Design did in this spectacular Palm Beach living room. 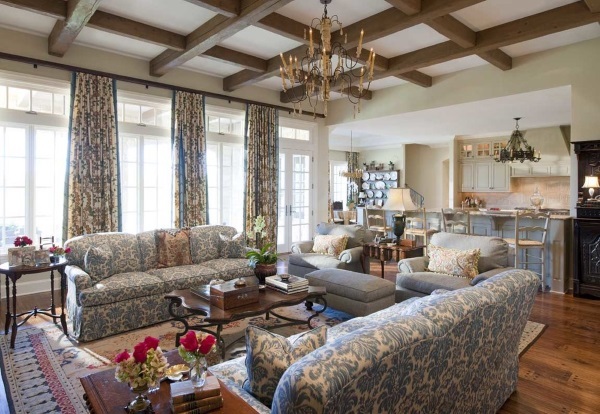 Image courtesy Florida Design Magazine. Rug Design © Asmara, Inc.
7. 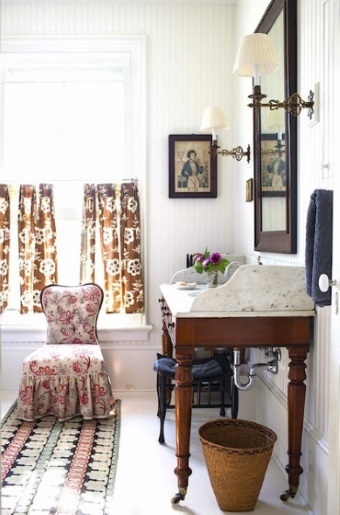 Create a contemporary ambiance in a bathroom as designer Markham Roberts did by pairing a needlepoint runner rug made from the borders of the Canterbury Needlepoint Rug 2818B. Image courtesy Elle Decor. 8. Bring elegance, warmth and color to an open plan living and dining area with a handsome needlepoint rug with vibrant red, blue and dark brown such as Kay Genua Designs did with the Canterbury Needlepoint Rug 2818B. Image courtesy Kay Genua Designs. Rug Design © Asmara, Inc.
9. 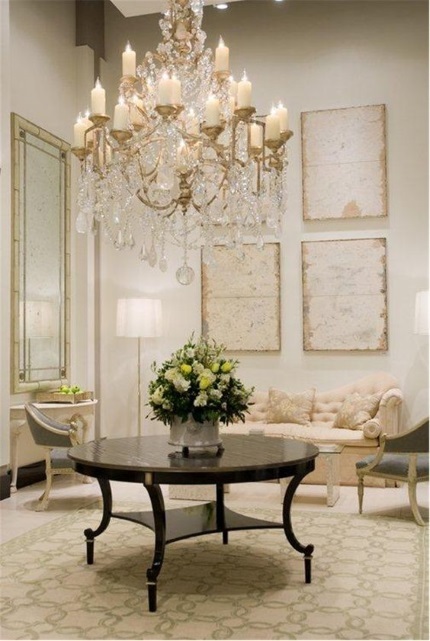 A cream and green geometric needlepoint rug allows you to bring a feeling of refinement and calm to a room that has fine antiques and crystal chandelier. 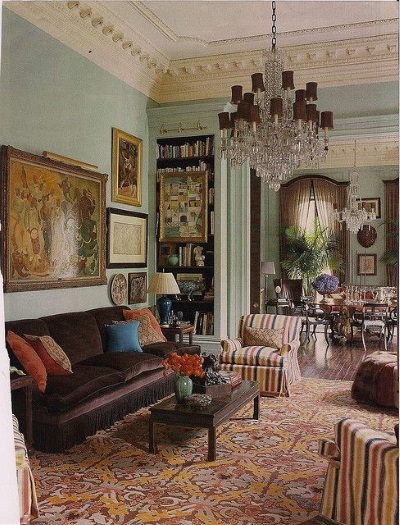 The secret is restricting the color palette to the colors found in the rug as designer Frank Babb Randolph did with the Bombay Needlepoint Rug 1325CG in the Washington Design Center's Dream House. Image courtesy Frank Babb Randolph. Rug Design © Asmara, Inc.
10. Add an elegant energy to a lakeside bedroom with an artist designed blue and white geometric needlepoint rug as Cebula Design did with the Ascot DB Needlepoint Rug 1326DB. Image courtesy Cebula Design. Rug Design © Asmara, Inc.
11. 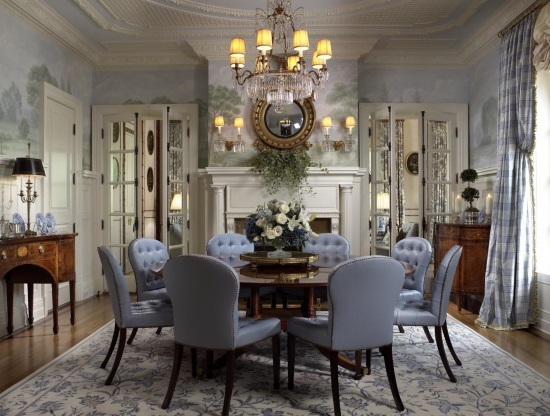 A cream and blue floral rug is a great anchor for a traditional dining room as in this design by Scott Snyder. Image courtesy Scott Snyder. 12. A blue and yellow floral needlepoint rug such as the Asmara Margate Needlepoint Rug 2089CB allows you to use a mix of yellow, gold, blue and white fabrics which will make the room feel inviting in both summer and winter. Image courtesy Architectural Digest. 13. An artist designed neoclassical needlepoint rug with green, gold and coral red make a great foundation for a Federal style dining room as AD 100 designer Bunny Williams did with the Asmara Directoire Needlepoint Rug 2014G. 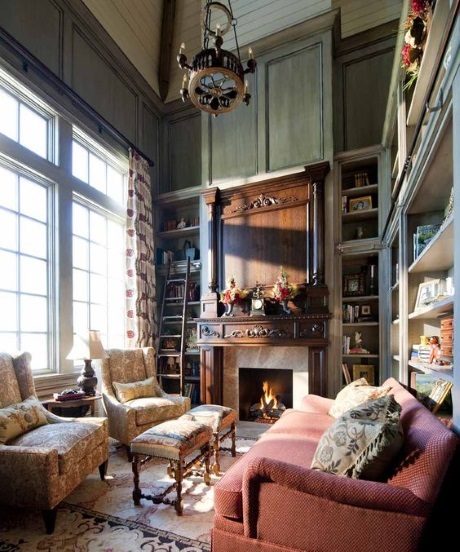 Image courtesy Architectural Digest and House & Garden. Rug Design © Asmara, Inc.
14. 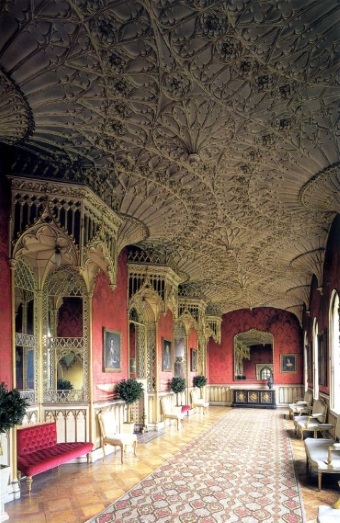 An Elizabethan needlepoint rug in cream, red, gold and charcoal complements the ornate ceiling and coral red walls in the Grand Gallery, Strawberry Hill House, Twickenham, London. 15. 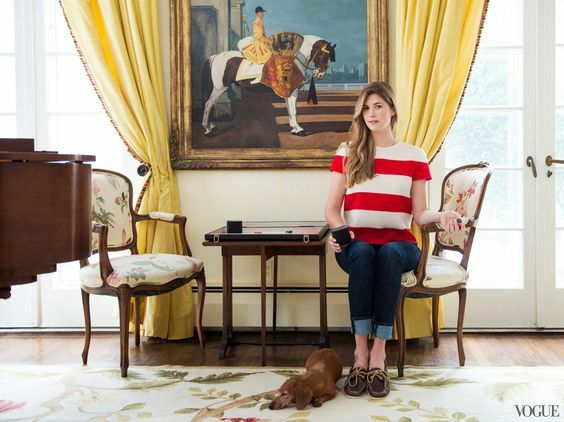 An antique red and gold damask needlepoint rugs complements green walls, brown silk sofa and red, gold and blue striped upholstered chairs in a handsome English living room. Photo by Jamie Meares.